What Is a Disappearing Quilt Block? A disappearing quilt block is a quilt block that's assembled in one piece and then cut apart into smaller sections, often equal fourths of the same block, but sometimes in halves or even thirds. The technique has been used for years, but the most well-known block that's sewn using the method is probably the Disappearing Nine Patch. Nearly any quilt block can be configured for the disappearing technique. Some patches in the blocks are altered in size if they are in areas that will be sliced. Otherwise, those patches could be too small (or out of proportion) once division takes place. The alteration isn't absolutely necessary, though, as long as all of the parent (original) blocks are the same. Disappearing techniques are fun to use because they offer many more quilt layout options than the original quilt blocks. It's more difficult to explain the technique than it is to show it with illustrations. The patterns below all offer a step-by-step look at a few ways to use disappearing quilt block methods. Bonnie Scotsman quilt blocks typically look like the blocks in the on-point cluster shown in the right-hand area of this photo. Sewing the blocks with disappearing techniques won't change the look of the final blocks, but it does speed up assembly. Each large parent block yields four Bonnie Scotsman blocks. The method works perfectly when you want to make a scrap quilt. Here's an on-point quilt pattern made from Disappearing Bonnie Scotsman quilt blocks. Sally Thompson made this lovely example. The quilt in the pattern is larger, finishing at about 47" x 58", but you can alter its size in any way that suits your needs, just like Sally did. This is one of the easiest ways I've found to make a Bento Box quilt. Simply sew groups of parent quilt blocks with contrasting fabrics in areas that will touch when the large blocks are cut apart and then rejoined with a partner. The result is a typical Bento Box quilt block but without the hassle of sewing smaller patchwork units. Take a look at the finished Bento Box after the sections of these two parent blocks are sewn together. This Disappearing Nine Patch pattern explains the method and illustrates several different ways to alter color and contrast among the blocks. It includes a size chart to help you decide how large to sew your parent quilt blocks, along with the end results after blocks are sliced apart. Here's another version of the Disappearing Nine Patch that we used for a quilt exchange event in our quilting forum. The pattern includes information about the history of the design, along with tips to help you choose a block size and decide how to position squares for best color and contrast when blocks are cut apart. The last page of the pattern illustrates how to cut the blocks into quarters with a rotary ruler. Like Bonnie Scotsman, the Disappearing Antique Tile could really be called an appearing Antique Tile because the pattern is a simplified way to make four of the traditional blocks from one larger quilt block. 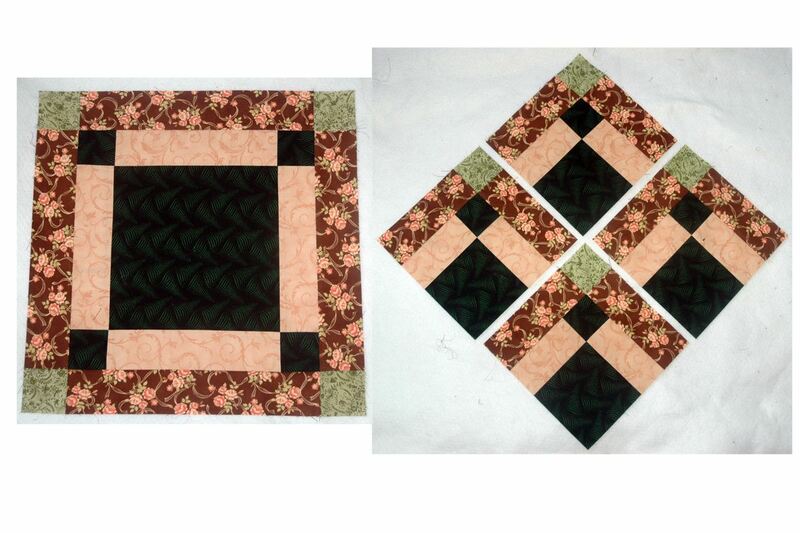 My quilt block is structured, with like fabrics used in the same positions. Remember that you can sew a large quilt block in a very scrappy manner by changing the fabrics in each area of the block.